The Gish Sisters Blogathon is over but what a fun ride it was! The contributors outdid themselves and it was a great pleasure to read their posts. The blogathon was the culmination of five months of behind-the-scenes work. I began to plan in April, made the banners and invited my co-hostess aboard. The biggest challenge? Keeping the secret until the announcement in July! I like to plan ahead but I hate to keep secrets. Well, I am keeping more secrets from you, readers. I have a few new features and special events in the pipeline and I fully intend to knock your socks off. In fact, you may want to watch those socks on Sunday because I will be making a huge announcement. You’re going to like it, I promise. But enough mysterious-type talk! I wanted to give you some details on what is coming up on Movies Silently. I will be covering The Power of the Press starring Douglas Fairbanks Jr. and directed by Frank Capra. You can join up by getting in touch with either hostess, Comet Over Hollywood or Lindsay’s Movie Musings. This is going to be fun! I will be inventing a 60’s-style starring-everyone-famous-in-the-whole-world adventure comedy… in the silent era! Fairbanks or Swanson or Valentino or Pickford or Barrymore? Yes. You can get in touch with Silver Scenes to join up. 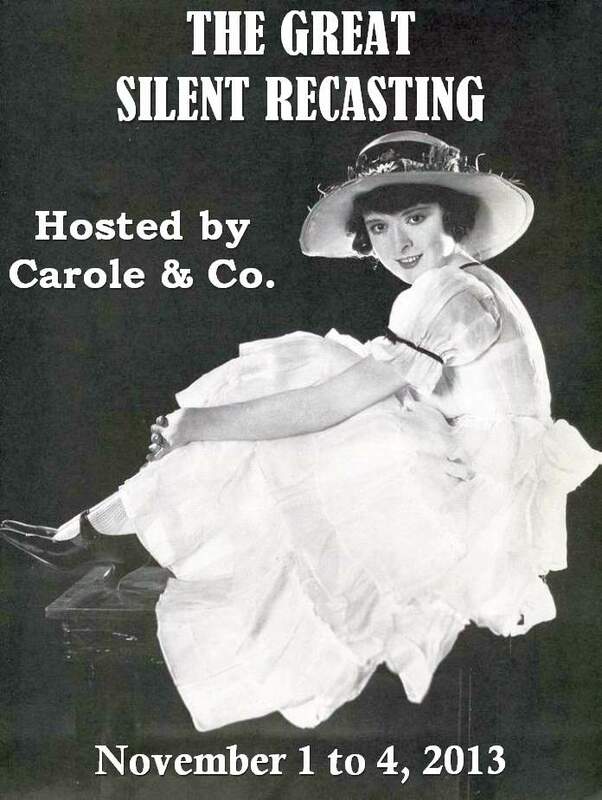 Inspired by my Silent Take posters, Carole & Co. is hosting a bit of silent recasting. I am signed on for Star Wars circa 1915. You can join up by contacting the host blog. Once Upon a Screen, Paula’s Cinema Club and Outspoken & Freckled are co-hosting the second What a Character Blogathon! I will be covering Tully Marshall in a review of the 1929 Technicolor film Redskin. In other news, I will be continuing my assorted series and I will be getting back into the mini biographies. Haven’t written any of those in a while and I really enjoy making them. And next month’s theme is Reader Requests! I got an overwhelming list of amazing films but I have narrowed down my selections. It was a challenge to choose only five films but I did it in the end. I will be announcing the final choices in October and, as promised, if I choose your suggestion, I will link to your (SFW) blog or website. Wow! There is a lot going on! And, can’t wait for your big announcement on Sunday.